"The doctor and her staff are very professional, caring and knowledgeable." "This is one Dr. visit I don't dread since it's like visiting friends." "Dr. Tolston is super smart and wonderful." "With Asthma evaluation and treatment now I am significantly better." "Excellent Doctor and so professional. I was so impressed by her knowledge and care." "I feel so healthy and my skin has completely cleared. Thank god for Dr. Tolston!" "Dr. Tolston is great. She really helped me. I no longer suffer." Evelyn Tolston, MD, opened her practice, Allergy Asthma and Immunology on Madison, with a mission to provide exceptional adult and pediatric care in Midtown East, New York City. She believes in a multisystem approach that searches beyond obvious symptoms to identify the precise cause of each patient’s condition. Combining her extensive clinical experience and academic background with today’s most current medical developments, Dr. Tolston creates customized care that helps each patient overcome their symptoms and thrive. As an expert in asthma and all types of allergies, Dr. Tolston treats a wide range of issues associated with those conditions, such as headaches, migraines, sinusitis, and chronic fatigue. 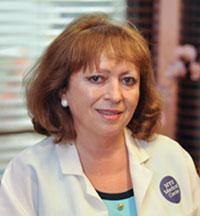 She also specializes in complex immune system disorders and system-wide problems like mast cell activation syndrome. After receiving her medical degree from Danylo Halytsky Lviv National Medical University in Ukraine, Dr. Tolston completed her residency at Cabrini Medical Center and her fellowship at Albert Einstein College of Medicine in New York. She holds dual board certification in allergy, asthma, and immunology, as well as internal medicine. She’s a Fellow of the American Academy of Allergy, Asthma, and Immunology and an active member of the American Medical Association and the New York State Society of Allergy, Asthma, and Immunology. Dr. Tolston has been honored with numerous accolades and awards. She’s listed in New York Top Doctors, the New York Times’ Super Doctors, and in Castle Connolly Top Doctors in the New York Metro Area. Her expertise has been featured on WABC (Eyewitness News) and she has served as a guest speaker on numerous health education radio shows in the New York metro area. Dr. Tolston welcomes both established and new patients at her office in New York City, where she speaks fluent English, Russian, Polish, and Ukrainian. We accept most major insurance companies excluding HMO providers. If you do not see your insurance provider listed, please contact our office for the full list of accepted insurances. "I can finally breathe normally! After many years of allergies and allergy related infections, I can finally breathe." "My son was extremely pleased with all the professional treatments along with the smiles and care that he acquired from Dr. Tolson and her entire staff." "She is one of the top New York Doctors who is well recognized for treating patients suffering from allergic reactions at affordable prices." "I found Dr. Tolston to be an excellent Dr. and so professional. She took the time and answered all my questions. I found her very caring and attentive." "Overall experience with Dr. Tolston & her staff was excellent." "I feel so much better, she knows her stuff! I would highly recommend you go to see Dr. Tolston." "I am so glad I found Dr Tolston! My rash finally went away and my allergies are under control."